This weekend our family will celebrate our Two Month Anniversary as Puppy Owners. To be completely honest, it has felt much, much longer. 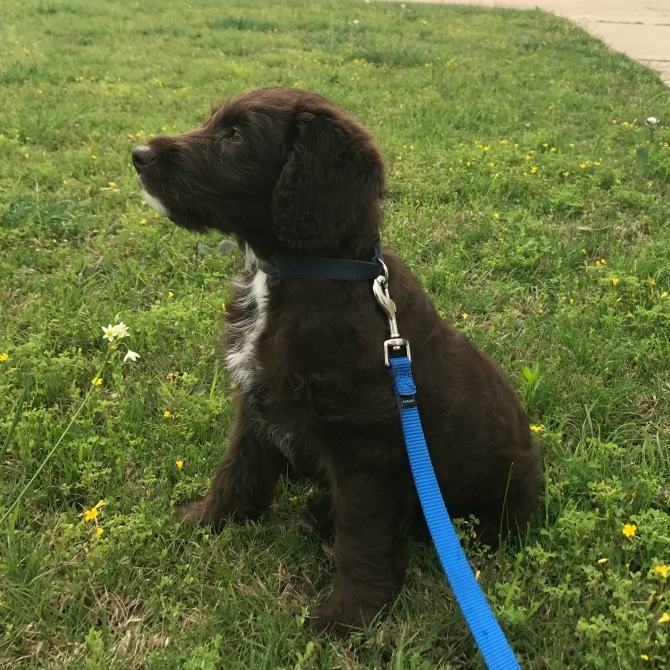 These two months have been a huge learning experience for me, and I wanted to share a few lessons and takeaways here—both for personal documentation purposes, and also to inform any of you who might be thinking of getting a puppy. 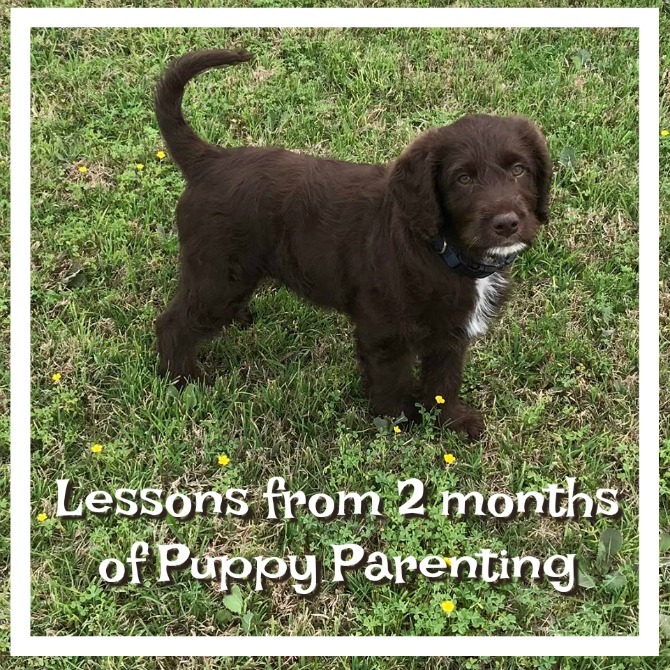 For those of you who have personal puppy experience, this post will likely give you a good laugh, or at the very least bring back some memories of your own days with a pup; I just hope it doesn’t stir up any traumatic ones! I’ve never owned a puppy. I grew up with a Golden Retriever, but my parents had gotten her a few years before I was born, so she was well into adulthood by the time I came along. When I was in college we adopted a 2-year-old greyhound; he was a great dog, and though he had his own unique set of issues, he was well beyond the puppy stage. As for Luke, he had many dogs growing up, and a number of them came into his family as puppies. 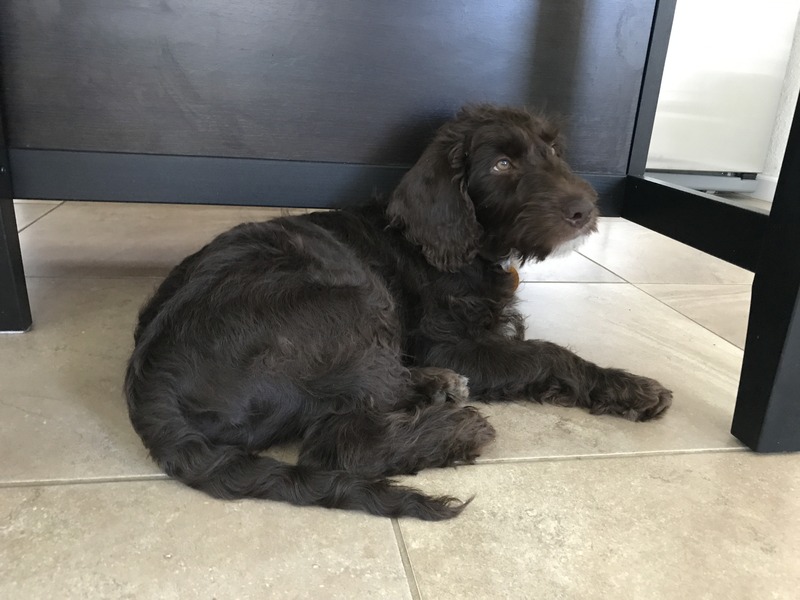 But they were all outdoor dogs, being raised alongside other older dogs; we now realize that Luke’s puppy experience was very different from our own situation of having an indoor puppy, and raising him as a singleton. A dog’s sense of smell is up to 100,000 times better than that of humans. Dogs take in their surroundings first through scent, then sight, and lastly sound (which Cesar Milan refers to as the nose-eyes-ears priority); this is why they aren’t always quick to respond to verbal commands and cues. They are too distracted by all those smells! Dogs really do love to chew on shoes; I’d always assumed that was a myth, or at the very least an exaggeration, but Arlo’s lightening fast reflexes around stray shoes have taught me otherwise. Puppies also dig where they aren’t supposed to, jump up on furniture and tiny humans, nip and bite everything in sight, and pee inside the house—a lot. They also may go to the bathroom in their crates (even though EVERYONE told us that dogs never poop or pee in their personal space; apparently Arlo didn’t get that memo). 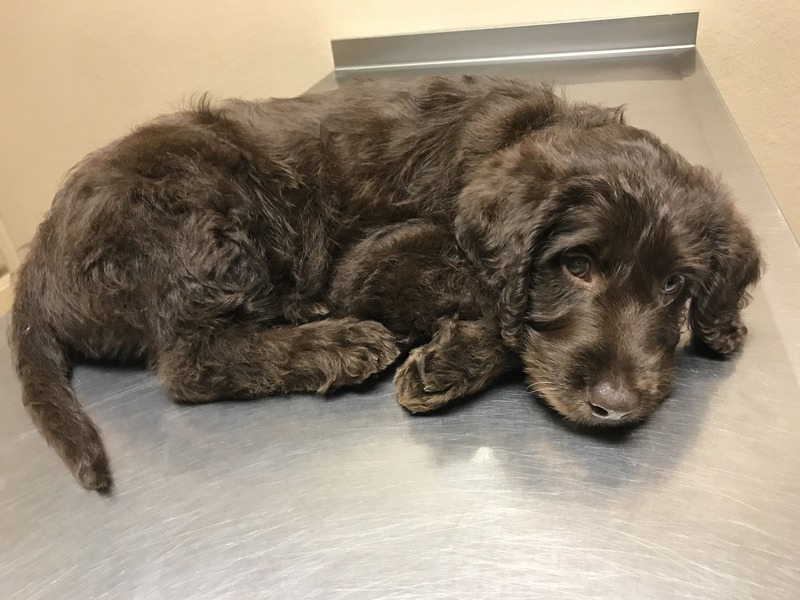 Experts (and our own vet) warn against exposing your puppy to unvaccinated dogs—or even taking them places where other dogs might have been—until they’ve received all of their shots. And there are multiple rounds of shots. Arlo just received his final round of shots this past Monday, and we still need to wait until next Monday before we came bring him anywhere beyond our yard. We sure are looking forward to getting to take him on real walks! Bringing a non-housebroken dog into the home might cause your fully potty-trained three-year-old to regress on the toilet training front. Ahem. For a time, Charleston and Arlo seemed to be competing for who could have the most accidents in a single day. Before we brought Arlo home, we were constantly told by other dog owners that bringing home a puppy was exactly like having a newborn. I was skeptical. How could a (mostly self-sufficient) four-legged little fur ball be anything like parenting a brand new human? I’ve spent the last two months thinking about ways that parenting a baby is similar to parenting a puppy, and how they are different. Spoiler: I’ve determined that a puppy is much more like a toddler than a newborn. Both puppies and newborns result in a lack of sleep. With a baby, you’re up throughout the night for feedings; with a dog, it’s for trips outside. There have definitely been nights when I’ve wished we could just slap a diaper on Arlo and call it a day. Having a baby was more work for me (because Charleston was exclusively breastfed and we didn’t pump—feedings were completely up to me); having a puppy has been more work for Luke (who has been taking the reigns with a lot of the housebreaking and other training). Babies and puppies both let you know when they need your attention. A dog’s bark is hard to ignore, but you CAN ignore it, whereas a crying baby needs immediate attention. Along those lines. . . you can’t get away from the work of an infant, they are constantly with you. But dogs are just fine being left home alone in a crate for a while. Those breaks are a game-changer. Puppies grow a lot more quickly than babies—and that’s a good thing! I have spent most of Charleston’s childhood (particularly the earliest days) bemoaning the fact that he was growing faster than I could keep up; I’ve wanted to hold onto and savor every minute. 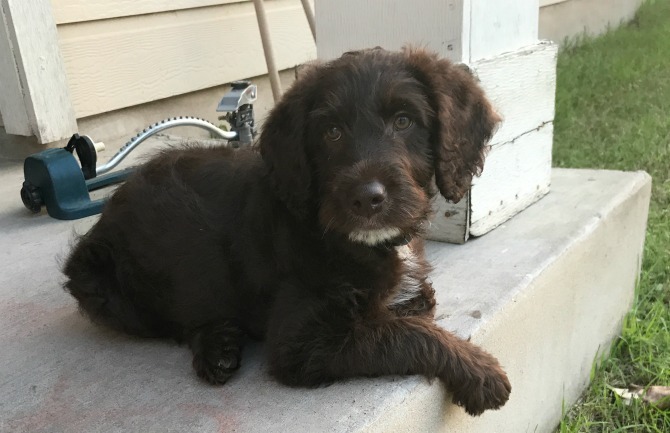 With Arlo, it’s been a different story; he’s an adorable puppy, but I am eager for him to grow into a full-grown (better behaved) dog. Thankfully, I don’t have long to wait. He’s already doubled in size since we brought him home (literally! He was 12 pounds at two months old, and now he’s right around the 30-pound mark. That’s more than my 3-year-old!). 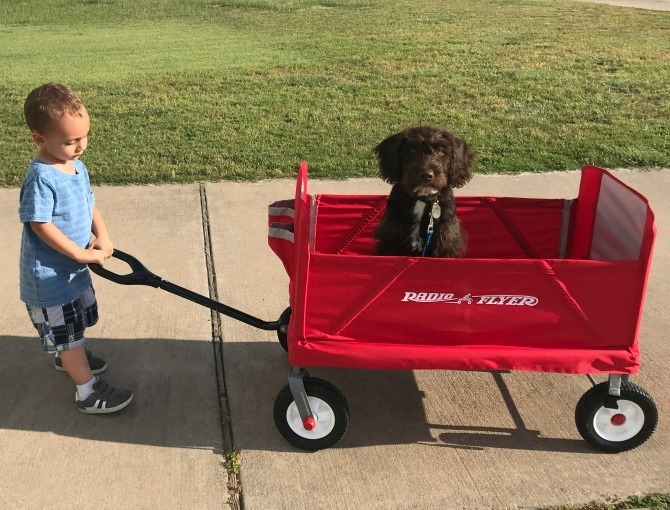 Children and babies both require a lot of work; I’ve found that tending to a dog’s needs is more physically taxing (dogs move a whole lot faster than newborns), while a baby was more emotionally exhausting (which ties back in to the fact that you can physically leave a dog, but never a child). Disciplining a puppy is a lot like disciplining a toddler; you have to be firm, calm, consistent, and immensely patient. It’s vital that you stay on top of poor behavior and nip it in the bud. It’s on the discipline front that Charleston and Arlo are currently in a very similar stage. I’ve found that, while Arlo’s infractions are bigger, he is much quicker to respond to correction than my son. Parenting a child is very instinctive: you respond to his cries, and it’s fairly simple to determine what he needs. Training a dog according to the experts’ advice has been completely non-intuitive. Instead of responding to whining or barking, it’s best to ignore it. You can’t love a dog into obedience the way you can a child. There is such a thing as being too indulgent with a puppy, whereas it’s impossible to spoil an infant. Baby and dog experts both discuss the importance of having a calm, authoritative energy. It’s not something I’ve mastered with either my child or our dog, but I have definitely witnessed its effectiveness when I’ve been able to get into that calm zone. Both children and dogs are difficult to manage, but very rewarding. The joys outweigh the challenges. However—and I know this isn’t true for everyone—for me personally, the joys of parenting a newborn were more plentiful than those we’ve had with a puppy. 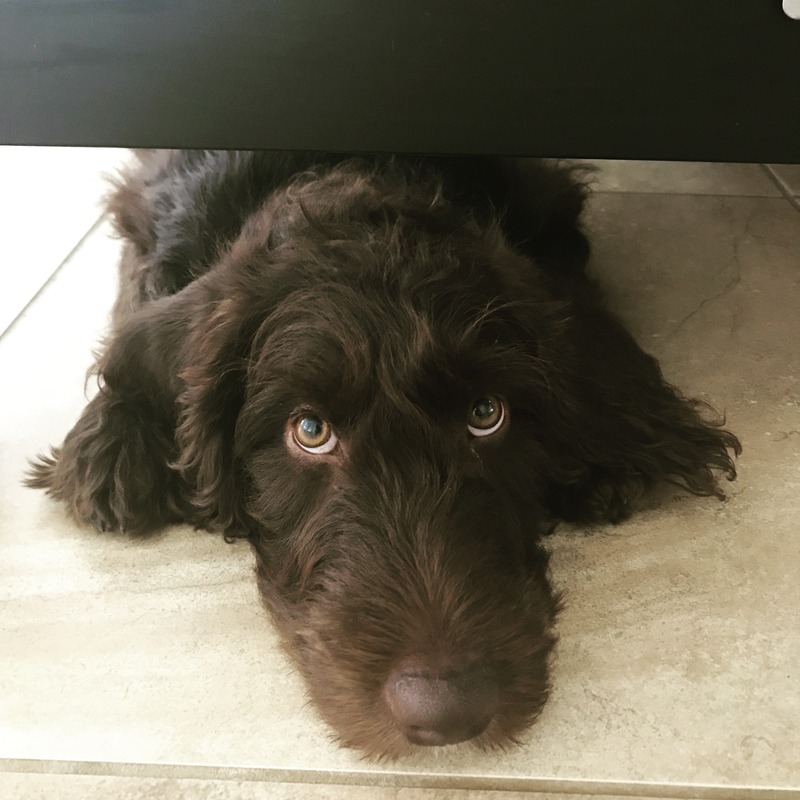 Like children, puppies are expensive (those pesky vet bills!) and require quite a bit of gear. Here are few of the items we (and Arlo) have loved, as well as a couple of additional resources and recommendations. How to Raise the Perfect Dog, by Cesar Milan: We’ve read quite a few dog books, but this one was the most helpful. You can read my full review here. We haven’t entirely adhered to Cesar’s methods, but this book gave us a great foundation. 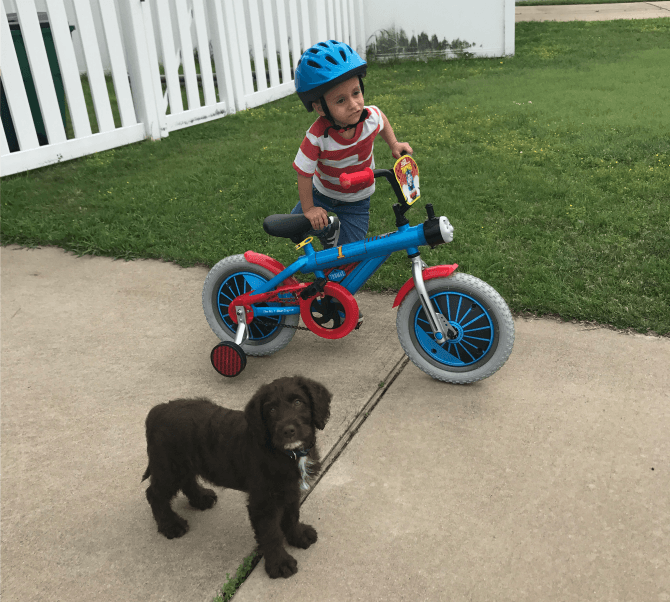 Dog Training: After our first few VERY rough weeks with Arlo, we knew we needed to bring in some extra help, so we hired a dog trainer to come to our house. (For local readers, this is the company we used.) I realize this was an indulgence, but it’s one I would highly recommend. Nina was able to see our space and give us specific recommendations for changes we could make. She helped us with general behavior issues and introduced us to specific skills to teach Arlo using clicker training (something I would have had zero clue about how to do on my own). She worked with us for three weekly sessions and got us off to a great start. 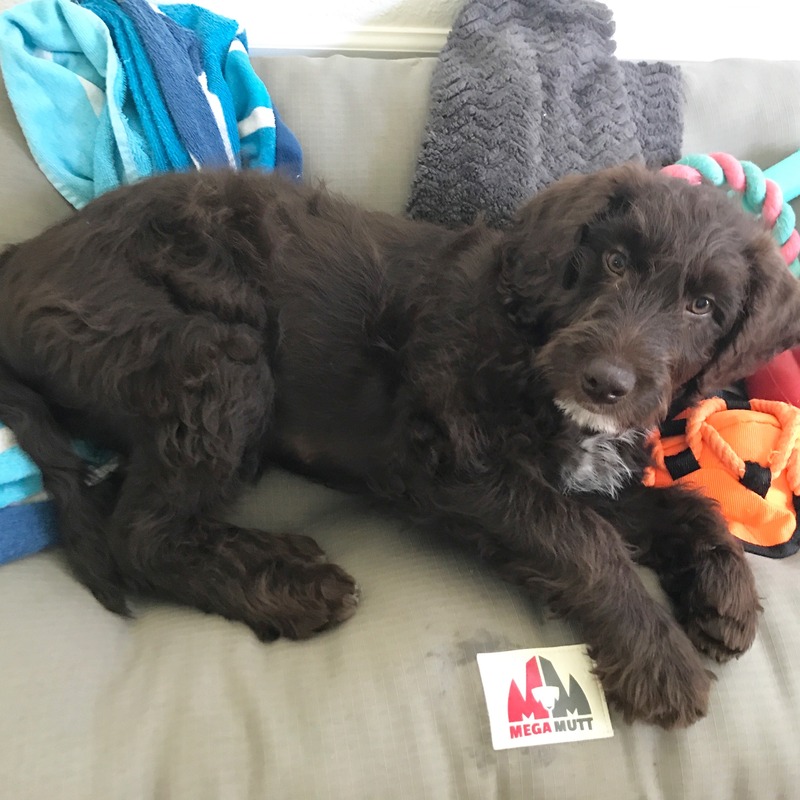 We plan to do more thorough training sessions when Arlo gets a little older, but the puppy sessions were a huge lifesaver in those early weeks. Crate: I was a little reluctant to use a crate, as I didn’t have personal experience with using a crate and it seemed cruel to confine Arlo to a cage. However, crate training is recommended by nearly all dog experts (as well as all of our friends) and I’m glad we decided to get one. Arlo doesn’t love his crate and still barks quite a bit when we first put him in at night, or when we leave the house, but he rarely gives us much difficulty when it’s time to put him in, and after a little barking he generally settles down. The crate has made nights a lot more manageable, and it gives us a place to put Arlo when he’s getting too rowdy with Charleston and needs a time out. The crate we have has an adjustable panel that has allowed us to expand the crate as Arlo has grown. Pet Playpen: When Arlo’s behavior is getting out of hand, but he’s barking too much to keep in his indoor crate, we move him to this playpen which we’ve set up in our yard. We can’t leave him in our yard unattended since he’s a digger, so this gives us a safe place to keep him outdoors. Dog Food: We started off feeding Arlo HEB’s Heritage Ranch food because that’s what his breeder had been giving him. We have since transitioned him to Nature’s Domain Puppy, a grain-free food from Costco that was recommended by our trainer. We transfer the bags of food into this container, which we store in our laundry room. When we first got Arlo we were feeding him three times per day, but now feed him in the morning and at night (he doesn’t always finish his food, but we remove the bowl as soon as he shows signs of being done). Cadet 12″ Bully Sticks: Arlo is obsessed with his bully sticks and chews on them all day long. I’ve linked to the product on Amazon, but I was able to find them much cheaper at Costco (a 12-pack for under $30). Ziwi Dog Treats: We use these for our clicker training with Arlo. (We use this clicker.) They’re pricy, but the perfect size and make for a good reward. We keep the treats in this pouch during training. Elevated Dog Bed: When we brought Arlo home, we had a small soft bed for him in his crate. That was demolished within a week and we haven’t replaced it. However, our trainer recommended this cot and it’s worked out great. Arlo likes hanging out on it (or sometimes sleeping underneath it) and it works well for training—it’s an easily distinguishable “place” to send him to and expect him to stay. 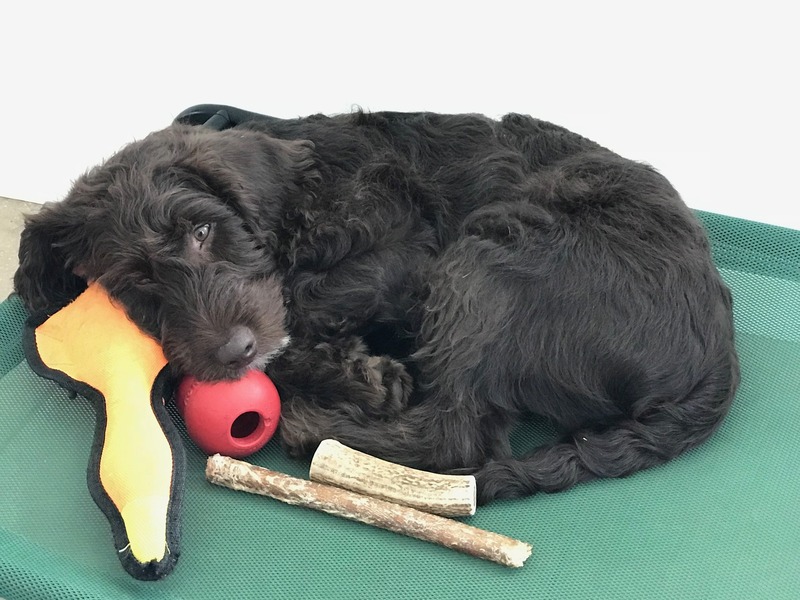 Duck Dog Toy: Arlo has quite a few toys, but this simple nylon duck (picked out by Charleston) is his favorite. It’s held up to endless chewing and tug-of-war and is super easy to clean. Stain and Odor Remover: We’ve had a lot of house accidents (though thankfully they have become much less frequent). As soon as Arlo has an accident on our floor or in his crate, we spray the area down with this enzyme formula. He’s never peed in the same place twice (other than his crate) so I’m guessing it really does work to remove odors. Even now, when we’re still in the thick of the puppy stage, I have no regrets about becoming puppy parents. Arlo is adorable and so much fun. He’s playful and affectionate and hilarious to watch. And Charleston ADORES his puppy, which has been the absolute best part of these past two months. Even when Arlo jumps on him and bites him, Charleston wants to smother his puppy with hugs, introduce him to all of his books and toys, and play with him as much as possible. Charleston has gotten pretty good with Arlo’s commands, and I think Arlo listens better to him than he does to Luke or me! It’s so rewarding to see Charleston stepping into his role as Big Brother to Arlo, and he has matured so much through this process. 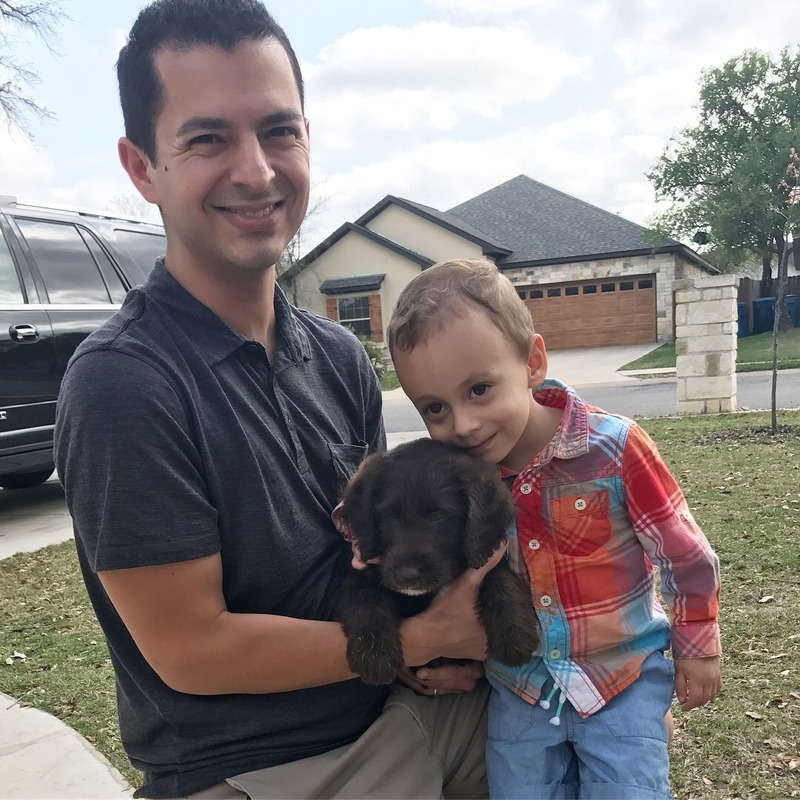 There have been numerous moments when Luke and I have wished we’d gotten a dog before having a child, so that we could have devoted our full attention to his training and care. But we would have missed out on seeing our two kiddos grow up together, and that is proving to be priceless. I’d love to hear from you: if you are a dog owner, what are some of your best and worst puppy memories? What resources proved essential? If you have any advice you’d be willing to offer, I would definitely appreciate your feedback!